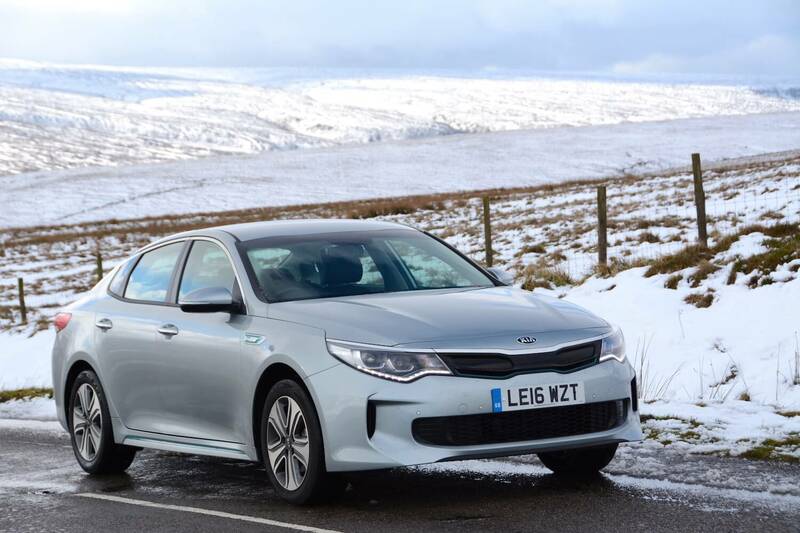 The Kia Optima Plug-in Hybrid saloon offers the potential of 176mpg if driven primarily on electric power, along with low emissions and attractive company car tax rates. 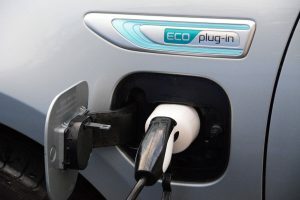 Increasing numbers of manufacturers are bringing plug-in hybrids to market due to increasing global legislation to improve air quality, as well as to lower CO2 emissions, and both Kia and Hyundai are currently joining the PHEV party. If you’re looking for a plug-in hybrid saloon, then the Optima may tick your box. 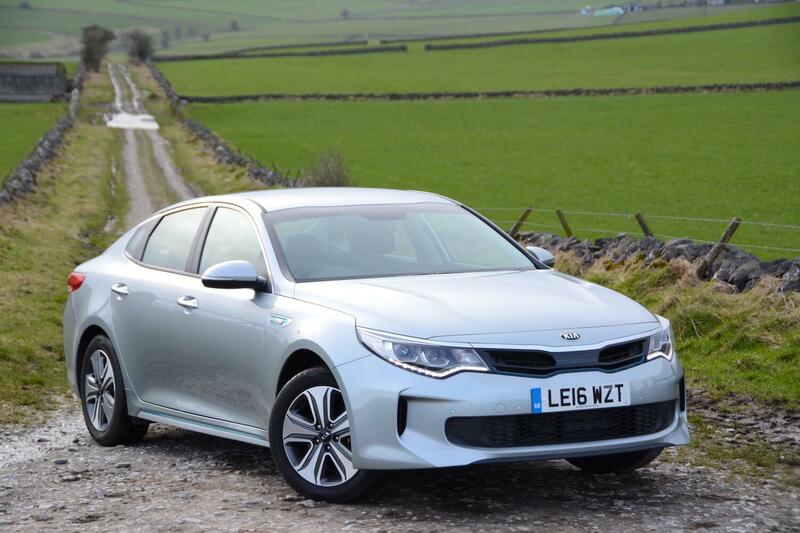 The plug-in hybrid shares its saloon body style with the regular Optima. That means decent rear legroom, but a boot rather than a hatchback. 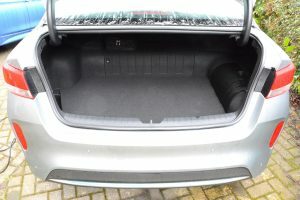 And you even lose some space in the boot due to the battery, which sits behind the rear seat. 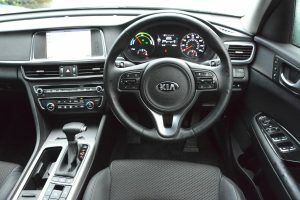 The interior is also fairly conventional, with Kia’s common sense approach to dashboard layout and switches, and even the satnav graphics are really clear. You get heated seats and a heated steering wheel in an effort to encourage you to cut down on heating the cabin to conserve the battery’s range. Like the Kia Soul EV, you can opt to heat just the driver’s side of the cabin only. There’s a 154bhp 2-litre petrol engine under the bonnet, and this is supplemented by a 67bhp electric motor, powered by a 9.8kWh lithium-ion polymer battery pack. Because this is a plug-in hybrid, you plug the car in to charge it. 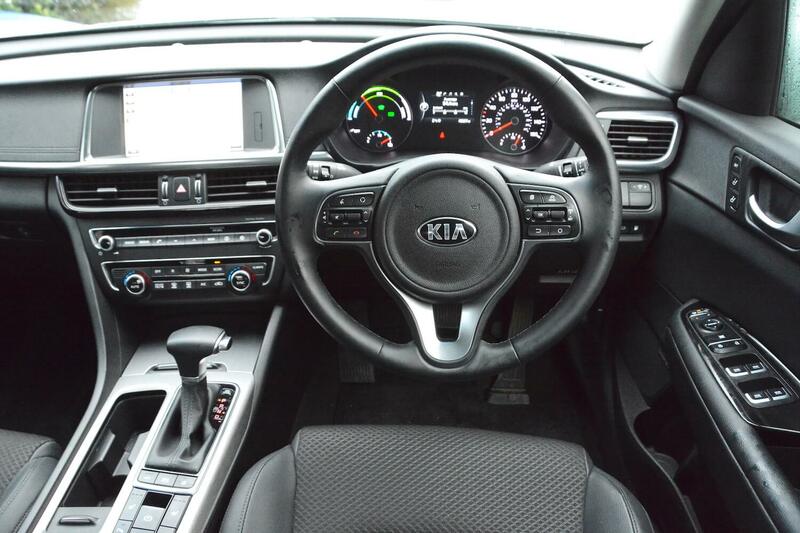 Rather than a CVT gearbox that many people expect in a hybrid, the Optima has a six-speed automatic transmission, along with front-wheel drive. One of our first drives in the Optima didn’t go as planned. We had to get to a photoshoot on the other side of Nottingham, which meant driving over the Pennines. As we came to the turning for the A57, the radio announced that it was closed due to snow. The only other route we could take to get us there in time was open but also snowy, as well as very busy due to the traffic volume being bloated by vehicles – mainly trucks – diverted from the A57. So although the overall headline is that the Kia Optima PHEV is generally perfectly acceptable to drive under normal conditions, our conditions that day weren’t normal, as we needed to overtake numerous slow moving trucks climbing up over the Pennines on roads semi-covered in snow. 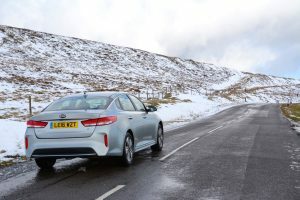 This was perhaps an unfair test for the Optima, as it’s not really designed for such a challenge, but the verdict was that it under such a test it doesn’t have much acceleration, or grip, even if the wheels are on tarmac rather than snow – albeit cold and wet tarmac. It was certainly more effective to extract slight extra reserves of acceleration if you changed gear manually. There are no steering wheel-mounted paddles to do this, you have to use the gear selector. A ‘power’ mode would have been useful, but this is something the Optima doesn’t have. We eventually made it to the top of the Pennines and as soon as we were on the East side all the snow disappeared. 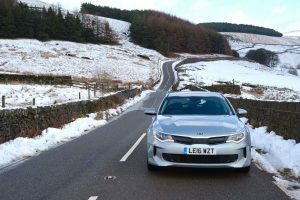 This meant we could enjoy the relatively low centre of gravity of the Optima through the corners, and, if not pushed, it demonstrated decent levels of handling and ride quality, resulting in a comfortable driving experience. A button allows you to select HEV (hybrid) mode or EV (electric) mode. However even when we selected EV mode, the car still operated on its petrol engine at times. Our preference would be for EV mode to fully lock it in EV mode, as if you want the petrol engine to operate, you would presumably select hybrid mode. With the petrol engine running occasionally even in EV mode, this ruins any attempts to achieve 100mpg+ economy figures if doing short drives on cold mornings. There’s also an Active Eco mode which dials down the power. What is useful, if you have any battery charge left, is the ability to make progress in traffic jams on electric power. The official combined NEDC economy figure for the Optima PHEV is 176.6mpg, equating to CO2 emissions of 37g/km. As any regular reader of Green Car Guide reviews will know, this is a completely meaningless figure, as you’ll only have a chance of coming close to this if you drive a similar distance to the (short) NEDC test. So as with any plug-in hybrid, if you drive less than 30 miles after a full battery charge, then you may see over 100mpg. The longer you drive on the petrol engine, the more that economy figure will drop. 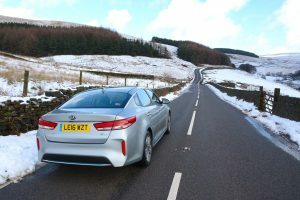 After a week of mixed driving, with some long journeys, we averaged 49.2mpg – not far off the extra urban figure that Kia quotes for the Optima PHEV of 53.3mpg. If we could have locked the car in EV mode and prevented the petrol engine from firing up at all then this economy figure would have been more impressive. The car displayed a predicted range of 31 miles after a full battery charge; the official range is 33 miles. There’s a 15-litre reduction in the car’s fuel tank, but you still get a decent overall driving range. With the help of active aerodynamics (primarily an active air flap grille), the Optima PHEV has a Cd figure of 0.25, which is impressive. 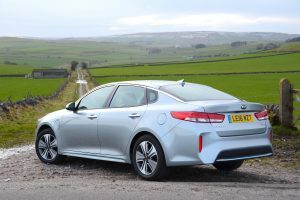 The Kia Optima 2.0 GDi PHEV Auto costs £31,495. It’s a standalone model in the Optima range. 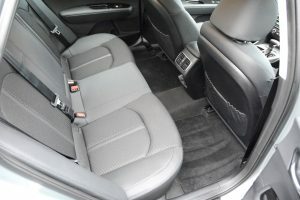 You can also buy a 1.7 CRDi Optima saloon and Sportswagon (estate), both in four different trim levels. Al Kia models come with a seven year/100,000 mile warranty. For people who regularly drive less than 30 miles between charges, with occasional longer journeys, plug-in hybrids offer the potential to have zero emissions locally, without the range anxiety of a pure electric car. 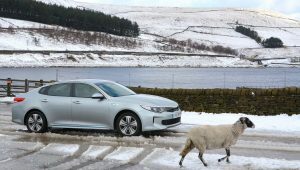 Being a saloon, the Kia Optima PHEV also offers reasonably efficient transport for longer journeys; although it has a petrol engine, it doesn’t have the aerodynamic properties of a barn, or the weight of a small truck, unlike various plug-in hybrid SUVs. The body style also means that the Optima has a lower centre of gravity than SUVs and crossovers, which means it goes round corners better. 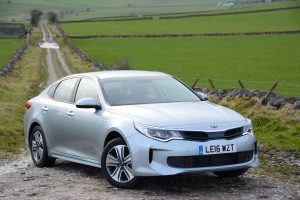 So the saloon body style has advantages in terms of efficiency and handling, but the trouble for Kia is that very few people buy saloons in the UK. Combined with this, relatively few people buy plug-in hybrids, although sales are growing rapidly, albeit from a low base. So the Kia Optima PHEV gets our thumbs up because of the potential of low emissions, but it’s likely to remain a niche choice; it gains a Green Car Guide rating of 7 out of 10. However Kia announced at the Geneva Show that the Optima Sportswagon (ie. estate) will soon be available with the plug-in hybrid powertrain, which will make the Optima an altogether more practical proposition.